Guarding her wasn’t his job, but he couldn’t let her die…even before she stole his heart. Although Willow and Remi had only two nights together several years ago, the former Navy SEAL was pleased to discover that she was still working for the U.S. Embassy in Venezuela. In the politically tumultuous country to guard an oil executive during sensitive negotiations with the new president, Remi discovers the temptingly beautiful foreign service officer is being threatened. His protective instincts take over. Willow Cardenas was receiving threats almost daily. Someone wanted her out of Venezuela. With a new ambassador, the country on the verge of civil war, and nowhere else to go, she couldn’t leave. The last thing she needed was an overprotective man in her life, even if she was drawn to Remi by memories of their steamy past. 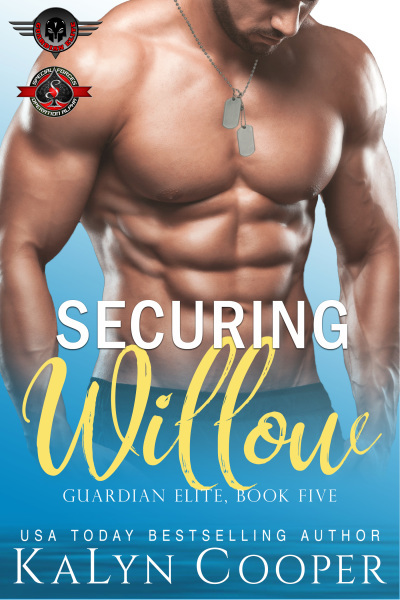 Securing Willow is the fifth book in the Guardian Elite series. This story is a crossover with Susan Stoker’s SEAL of Protection: Legacy series and written in her Special Forces: Operation Alpha world. If you enjoy reading second chance, military romance that keeps you on the edge, you'll like this book that includes the men of Susan Stoker’s SEAL of Protection: Legacy.